The PM’s main “misgiving” about Leveson’s recommendation of a new law to underpin an independent press regulator reflects his fear that such a law could be amended or replaced by some future illiberal government in such a way as to infringe the principle of freedom of the press. But that danger must be much greater if there is no law already on the statute book that guarantees press freedom and the independence of the regulators than if there is. Leveson makes an irrefutable case for statutory backing for the new independent regulatory body he recommends, and which he stresses does not equate to statutory regulation. Parliament should clearly accept and act on it. On the other hand, some American commentators, including the sainted Bob Woodward, one of the two reporters mainly responsible for unmasking President Nixon over Watergate, have been expressing horror at the idea of any UK law affecting the press, claiming that under the First Amendment any such law would be unconstitutional. The latest bizarre twist in the dispute is the Culture Secretary’s promise to draft and publish a Bill based on the Leveson proposals. The Bill’s declared purpose will be, not to present a government proposal for parliamentary legislation, the usual purpose of a government Bill, but the opposite: a document expressly designed to demonstrate by its reach and complexity that no such law could be made acceptable. If the government, or the Tory part of it, goes through with this weird exercise, it will be up to the Labour Opposition (which supports the Leveson proposal) and the LibDem members of the governing coalition who also support an under-pinning law, to amend the government’s deliberately flawed Bill so as to demonstrate that it can be made acceptable and effective without seguing into what could amount to state control. 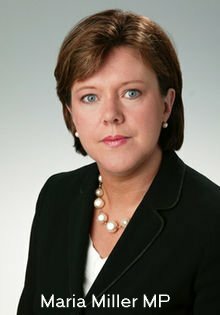 The Secretary of State for Culture, Media and Sport, one Maria Miller MP, promoted a few weeks ago from her former invisible role as Minister for Disabled People at the Department for Work and Pensions, has made numerous universally unimpressive appearances on radio and television since the publication of Leveson, loyally denouncing any idea of an under-pinning law while constantly repeating in the same breath her mantra that the government fully accepts all the “principles” laid down by Leveson, apparently unaware that the two propositions are mutually incompatible. Finally, today’s Financial Times reports that Ms Miller is convening a meeting of leading newspaper proprietors and editors next week at which she will urge them, not to draw up a plan along the lines proposed by Leveson for an independent press regulator, as they are invited to do by Leveson, but instead to devise an alternative to the Leveson blueprint! Apparently the prime minister’s and his Culture Secretary’s ‘acceptance of all the Levenson principles’ has some far-reaching limitations. There are evidently some lacunae in the Levenson report: his unwillingness to condemn at all forthrightly either the suspicious failure of the police to investigate and prosecute the widespread criminal activities of British journalists, or the potentially corrupt relations between leading politicians of both main parties and some of the mightiest press magnates: the absence of clear guidance on how to regulate those press publishers who opt not to sign up to the new (voluntary) independent regulatory régime; and the failure to address the over-concentration of press ownership in too few, often non-British hands. Then there’s the thorny question of the impossibility (thank goodness) of regulating the internet with the wild excesses of the social media and the blogosphere. But Leveson has given the press and parliament more than enough demanding tasks to be getting on with. It’s sad that the coalition’s Tory members, whose leader once promised to accept and act on Leveson’s recommendations unless they turned out to be “bonkers”, are already rejecting key elements in them, inviting the press once again, for the seventh time in as many decades, to regulate themselves without having to answer to any form of external, independent but non-state supervision, in the pitiful hope that this time self-regulation will eliminate the gross excesses and misbehaviour which up to now have disgraced substantial sections of the fourth estate. Up with that we should not put. And what’s often forgotten is that the printed media are already protected by Art 10 of the ECHR and our Human Rights Act–freedom of expression. But most of the press want to exit the convention! Brian writes: Thanks, Tony. A very good point. I think it’s a pity that the illustrious Shami Chakrabarti is suggesting that giving the press the privilege of immunity from exemplary damages as a reward for signing up to the proposed new voluntary regulatory system, as recommended by Leveson, would itself contravene the European Convention and the Human Rights Act, a most counter-intuitive assertion which I hope the lawyers will be able to counter. Thanks for an interesting read Brian. Brian writes: Thank you for this. Yes, I’ve already signed it, and urge everyone else to do so too. How about an independent regulator with power to force an offending newspaper to publish a mea culpa or retraction, depending on the circumstances, prominently on its front page or even to pay for the same to be published in other newspapers or read out in the broadcast media as well? Brian writes: Thank you for this. These suggestions look to me pretty much in line with what Sir B Leveson had in mind in his Report, and the press moguls given the task of drawing up detailed proposals may well include something of the sort in the system they recommend. But one of the features of the system as suggested by Leveson is that by signing up to the independent regulatory system each press organ will enjoy certain privileges not available to those who choose not to sign up, such as not being subject to the award of exemplary damages if it loses a libel case under the system. It will be necessary for the penalties available under the system not to be unduly draconian: otherwise no-one will sign up to it.